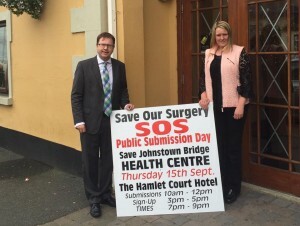 I am delighted to confirm a new GP has been appointed to Johnstownbridge Health Centre. This is a credit to all involved with the Save Our Surgery Committee, the 1000’s who gave their signatures and testimonials to the HSE, and David Walsh of the HSE. I had raised this matter in the Dáil chamber just last week and have been in constant talks with the HSE. This and the lobbying from Save Our Surgery Committee has clearly delivered results. Across the country this pattern has repeated when GP’s retired and are not replaced. This was a big concern in Johnstownbridge. We were determined to ensure this did not happen again. I am delighted the residents in North West Kildare will now have full cover once more. While the logistics have yet to be worked out we can confirm this will be a full time service restored to the health centre in Johnstownbridge this November. At a policy level it remains a concern that this issue could easily repeat in another rural practice, in Kildare or elsewhere, and I will continue to lobby at national level to address this.